White, the colour of peace, purity and serenity, inspires this Moods By Parks luxury fragranced candle. Scented with lotus, orchid, gardenia and hibiscus, this wonderful scented candle has been lovingly crafted to our exacting standards, guaranteeing pure and long-lasting fragrance in any room of your home. Using a medley of floral scents, known for promoting peace and serenity, our experienced perfumers have redefined purity and created a candle that inspires cleanliness, well-being and harmony in your living space. Every extract has been carefully selected for your complete enjoyment and perfectly captures the calm comfort of a spa in an elegant glass votive candle. A blend of sensual floral notes have helped to create this sensual and pure fragrance, from uplifting gardenia and hibiscus to the treasured and peace-giving properties of lotus and orchid. Lotus is particularly well-known for its heady, sweet scent profile, and has been used for centuries in the medicines and botanicals of the Far East, where it's beloved as one of the eight precious things of Buddhism. One of the great triumphs of this Purity fragranced candle is the introduction of an orchid note, whose exquisite petals emit a spicy, and vanilla-like fragrance. The orchid note helps to create a rich, velvety base note in this pure white wax blend, which contrasts wonderfully with the bright, uplifting bouquet of gardenia and hibiscus. 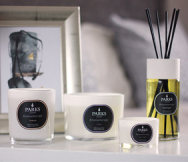 Featuring two wicks and 370g of pure natural wax, this Moods By Parks luxury candle delivers up to 60 hours of long-lasting fragrance, and is packaged in a luxury presentation gift box - making it the perfect gift for the fragrance lover in your life.